I recently saw a U.S. News article ranking the Best Diets for 2018 – the ketogenics diet was ranked tied for last place (39th)! Despite all the research, especially in the last two decades, and books written on low carb and ketogenic diets coupled with the increasing number of advocates, if you mention ketogenics to most people today, you’ll rarely get a well-informed description of this nutrition strategy. Even most professionals in the medical and nutrition community are woefully uneducated regarding this topic. This is largely due to the lack of information provided from professional organizations and academic courses. Even new college textbooks on nutrition, physiology and biochemistry have very little on the topic other than a cursory discussion of ketoacidosis as it relates to diabetes or starvation. Given its growing popularity, widespread use and clinical applications, this is most unfortunate as it is an extremely important and timely topic to understand for everyone, particularly those in the life sciences – including medical personnel, professors, students and researchers in physiology, biochemistry, nutrition and exercise science. My first experience with low carb diets was back in the ‘90’s when the ‘diet gurus’ were always arguing on TV – Atkins, Sears (Zone) and Ornish. I decided it would be easy enough to do a little in-house study to see exactly what was going on based on macronutrients – percent carbohydrates, fats, and protein in the diet while keeping total calories the same (as we were only interested in the impact of the macronutrients and not calories per se). So I recruited 10 employees and put them each on three different diets – one month on each. One diet was a 40/30/30 Zone style diet (40% carbs, and 30% each on the protein and fat); the second was an Atkins style low carb/high fat diet (20/20/60) – 20% carbs, 20% protein, and 60% fat (so this was only low carb not ketogenic), and the third was higher carb similar to recommendations at the time of USDA, AHA, Pritikin, Ornish, and sports nutritionists/endurance athletes: high carb/low fat (60% carbs, 20% protein and 20% fat). Since we kept the total calories the same, weight remained stable as expected but there was a dramatic difference in the test results – all cardiometabolic risk factors improved on the high fat/low carb diet, though individual responses as we know can be quite disparate. 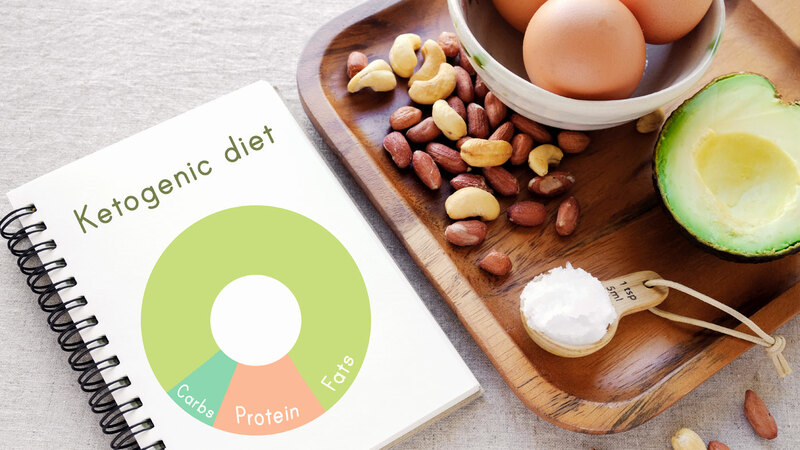 More recently, I was reviewing these ketogenic diets which are super low carb diets and as it turns out quite a bit different than simply low carb. I knew the only way to make an informed decision was to actually do it while documenting the results (‘integrity in numbers’). It was a case study for one month to explore the impact of a ketogenic diet on my personal physiology. This involved a diet of only 25-50gms carbs/day with moderate (20-30%) protein and >60% fat) – very, very low carbs and very high fat. Pre- and post-one month testing included blood tests, performance measures and body composition while also monitoring ketones, glucose, blood pressure, weight, waist every morning to track the rate of change(s). My results (not subject to statistical manipulation and population based norms) were as follows: a 13 pound weight loss in one month (from 186 to 173) even though I didn’t want to lose weight and tried to keep the total daily calories the same at ~2400/day. However, that was very difficult on such a high fat diet with such a high satiety factor. The results: BP went down from 122/80 to 88/58! !, waist dropped 2”, fasting triglycerides were already low at 78 but went down further to 48, HDLs increased from 50 to 62 (which is the best they’ve ever been), and glucose went from 99 ( a little high for me) to 85, while the LDL stayed the same (even up a point or two) which of course is why many think it’s so bad but more importantly the LDL particle size improved (meaning more of the big, fluffy non-risky LDLs and less of the dense, smaller, higher risk LDLs – particle size is the key to LDL risk now. In other words, every single marker of cardiometabolic disease (e.g., coronary artery disease and diabetes, hyperinsulinemia/ insulin resistance, inflammation, etc) improved. Performance measures, in contrast, were variable: strength measures did not decrease and even increased some despite the weight loss and low carbs (glycogen depletion and related water loss) but aerobic (treadmill and cycle) endurance declined significantly. Surprisingly however, many endurance athletes are using it now and swear by it but it’s not for everyone. The next step is finding one’s personal carbohydrate threshold level by increasing the carbs back in (slowly) and following the testing program monthly. By doing this, I was able to determine that my personal carb threshold is 150 grams/day which translates to 25% carbs (600 calories of a 2400 calorie/day diet) – still pretty low but infinitely better than <50 grams/day – at least for me… but we are all different right (see last month’s article on physiologic individuality). At the end of the day, isn’t that the defining variable – your personal response! Previous articleWhat Do You Hear?